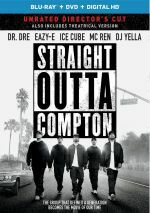 As I write this in mid-January 2016, Straight Outta Compton sits at 18th place on the list of 2015’s top-grossing films in the US. That doesn’t sound all that impressive, but given the movie’s budget and focus, I think it’s a massive accomplishment. A look at the box office chart shows Compton largely surrounded by big “tent pole” movies, many of which boasted budgets of more than $100 million, whereas Compton cost only $28 million. It’s not the only “cheap” film in the 2015 top 20 – hits like Pitch Perfect 2 and Fifty Shades of Grey were also relatively inexpensive – but I think Compton was the most surprising hit of the bunch. And also the least likely to spawn a sequel, as the biopic tells the story of the seminal rap group NWA. The story opens in 1986 and introduces us to Eric “Eazy-E” Wright (Jason Mitchell), a young drug dealer who narrowly escapes when police raid a crack house. Andre “Dr. Dre” Young (Corey Hawkins) lives a less dangerous life, as he avoids the criminal activities that imperil Eazy-E. His challenges come from his mother Verna (Lisa Renee Pitts); while he wants to make a career in music, she demands that he go to school or get a “real job”. At an impasse, Dre moves out of the family home. In addition, high school student O'Shea "Ice Cube" Jackson (O'Shea Jackson, Jr.) writes rhymes and aspires to rap. In particular, Cube wants to comment on the dark, violent reality that threatens other young African-American men like himself. 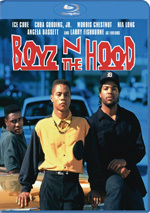 Along with Lorenzo "MC Ren" Patterson (Aldis Hodge) and Antoine "DJ Yella" Carraby (Neil Brown, Jr.), all these men eventually come together to form a rap group called NWA: “Niggaz Wit Attitudes”. They start to gain attention and take on manager Jerry Heller (Paul Giamatti). We follow the trials and tribulations experienced by NWA. Given how long it’s been since NWA first hit record shelves, it’s tough to remember what the rap scene was like before them. Plenty of rap artists commented on the realities of African-American life, but they didn’t go to the blunt extremes found in NWA’s lyrics. For good or for ill, NWA really did change rap forever. No one will come to the same conclusion about this film, however, as Compton offers an exceedingly traditional – and monotonous – biopic. As unconventional as NWA were, the movie hits every cliché note in the book. How could a movie about such a notorious, controversial act be so boring so much of the time? Compton simply never manages to get to the heart of its subject matter. Characters don’t develop much, as we get basic personality overviews for the leads and that’s about it. Oh, matters change around them, but the movie lacks true insight into the roles. I think much of the problem stems from the film’s scope, as it bites off much more than it can chew. I prefer biopics that concentrate on a reasonably short amount of time, as those “snapshots” can offer greater depth and detail. These movies focus on one or two pivotal moments and really explore them. Compton prefers to be more “epic” in scope, so it covers the entire existence of NWA, even though I don’t think there’s a logical narrative to be told there. The group’s rise seems cinematic, and some of their travails work as well, but their slow splintering doesn’t offer a lot of interest for the movie viewer. NWA fizzled out and didn’t end with a bang, so the story meanders badly in its second half. Viewers with knowledge of NWA can figure out where the tale will end: with Eazy-E’s death in 1995. I guess that’s a logical finishing point, but the film’s path to that event seems laborious at best. Again, the story just doesn’t feel like it boasts a lot of thrust during the movie’s second half, so we’re left with a lot of monotony as we await Eazy’s inevitable demise. Compton also tends to feel like sanitized history, though given the fact that Ice Cube and Dr. Dre co-produced the film, that should come as no surprise. The movie deals with controversies but not in a way that reflects poorly on NWA themselves most of the time, and its saccharine ending seems wholly contrived. Given how much animosity and squabbling existed among NWA members by 1995, the goopy finale feels unconvincing at best. I do think an NWA movie that better focused on the band’s early years and rise could’ve been very good. I also feel that if Compton took more risks, it might’ve fared better. As it stands, we find a safe, tedious biopic that gets less interesting as it goes. If nothing else, Compton boasts a great soundtrack – heck, it sold a CD, as I ordered a copy of the 1988 Compton album after I watched the film. Unfortunately, it sputters as a drama and ends up as a lackluster examination of its subject matter. “I Knew Them When” footnote: back in 1992, I developed an inexplicable fascination with the pop music revues that played at a local amusement park. Corey Reynolds – who appears in Compton as Alonzo Williams – sang and danced in one of those shows, and it was clear all the way back then that Corey had talent and charisma lacking in his peers. Corey may not have become a star, but he’s had a good career, and it’s fun to see him since I can remember him all those years ago. Straight Outta Compton appears in an aspect ratio of approximately 2.40:1 on this Blu-ray Disc. The film presented a solid transfer. In terms of sharpness, Compton showed good delineation. A smidgen of softness popped up on a few occasions, but those instances stayed minor and inconsequential, so that left us with a tight image. Shimmering and jaggies failed to appear, and I saw no edge haloes or print flaws. Colors tended toward teal and amber. Writing that makes me feel like the proverbial broken record, as I seem to cite some variation of those hues all the time, but that’s what I saw, and the tones appeared appropriately rendered. Blacks were tight and dark, while shadows showed nice smoothness. This ended up as a positive presentation. Given the subject matter, one would expect the film’s DTS-HD MA 5.1 soundtrack to emphasize music, and it did. The movie’s many songs filled the speakers in a broad and involving way that added to the experience. Effects had less to do, but they added life to the story as well. Scenes with police presence or violence created the liveliest circumstances, and quieted scenes demonstrated a nice sense of place as well. Add to that some localized speech and this was a pretty involving soundscape. Audio quality worked well. Speech seemed accurate and distinctive, without edginess or other concerns. Effects appeared clear and dynamic, while music was full and rich. This seemed like a strong mix for a drama. The Blu-ray provides both the film’s theatrical version (2:26:44) as well as an Unrated Director’s Cut (2:46:44). The main additions to the Director’s Cut come from character scenes, primarily those that expand the female characters. We see more of various NWA girlfriends in the longer version, and we get a few other character beats/jokes. I think a lot of these make a slow film even more sluggish – it’s interesting to see the Director’s Cut as an alternate, but the shorter Compton works better. We can view either version of the film with an audio commentary from director F. Gary Gray. He delivers a running, screen-specific look at story/character areas, cast and performances, historical background and period elements, production design, sets and locations, music, changes for the Director’s Cut and related topics. Gray’s commentary seems competent and no better. While he touches on a reasonable array of subjects, he doesn’t provide a lot of substance, and a lot of the track concentrates on praise for the project. I like that he remains chatty over the almost three-hour long Director’s Cut, and he does offer some good insights, but the discussion never becomes especially informative. Six Deleted Scenes fill a total of five minutes, 41 seconds. We also get a Deleted Song Performance (1:28). The first three cut sequences last barely a minute all together, so they’re forgettable. The final scene – “Dre Gets a Call” – is also too brief to contribute much. At two minutes, 38 seconds, “Nicole Visits Dre” becomes the most substantial deleted scene, as it shows Dre and his girlfriend when she sees him in jail. It’s a melodramatic sequence that doesn’t turn into anything memorable. The one-minute, 23-second “Reunited” offers a follow-up to this scene; it’s also sappy. As for the “Deleted Song Performance”, it gives us “Compton's N the House”. This becomes one of the less compelling “live” shots, as it seems curiously lifeless. Perhaps it would’ve gotten better editing/post-production if it had made the final flick. A few featurettes follow. NWA: The Origins goes for three minutes, 49 seconds and features Gray, NWA members DJ Yella, Dr. Dre, Ice Cube, and MC Ren, club owner Lonzo Williams, and actors Corey Hawkins, Jason Mitchell, O’Shea Jackson, Jr., Neil Brown, Jr., and Aldis Hodge. We get some basics about NWA as well as their involvement in the film. “Origins” works well for a short piece, but its extreme brevity makes it less satisfying. During the one-minute, 35-second Impact, we hear from Ice Cube, Dr. Dre, MC Ren, DJ Yella, Mitchell, Hodge, Gray, and DJ coach Robert “DJ Robshot” Johnson. They tell us of NWA’s importance. They tell us little of substance. Next we find Director’s Journey. It lasts three minutes, 22 seconds and features Ice Cube, Dr. Dre, Gray, and neighborhood technical advisor Cle Sloan. “Journey” looks at the film’s reproduction of LA during/after the Rodney King riots. Once again, the featurette’s brevity hurts it, but it comes with some good details. The Streets: Filming in Compton takes up six minutes, three seconds and includes notes from MC Ren, DJ Yella, Gray, Jackson, Sloan, Mitchell, Dr. Dre, Ice Cube, background performers Andrew Askins and Calvin Dowg, special effects coordinator Eric Frazier, police advisor Chic Daniel, electrician Mike Cruz, and actors Natascha Hopkins, Paul Giamatti and Keith Powers. We see aspects of shooting on location in Compton. The featurette gives us a decent look at this side of the production. With NWA Performs in Detroit, we get a four-minute, 54-second clip with Ice Cube, DJ Yella, MC Ren, Gray, Hodge, Brown, and Jackson. We view the filming of NWA’s infamous Detroit concert. It becomes another short but moderately useful featurette. Finally, Becoming NWA occupies eight minutes, 30 seconds and gives us comments from Ice Cube, Dr. Dre, Mitchell, Gray, DJ Yella, Hodge, MC Ren, Jackson, Hawkins, background performer Dredano Cobbs, rap consultant William Calhoun and Eazy-E’s children Eric Wright, Jr. and Erica Wright. The show looks at the actors’ attempts to recreate NWA. Expect a decent little show. The disc opens with ads for the movie’s soundtrack, Jarhead 3: The Siege, Race, Everest and Legend. No trailer for Compton appears here. A second disc provides a DVD copy of Compton. It includes the theatrical cut of the film with the commentary, “Origins”, “Impact”, “Journey”, “Streets” and “Detroit”. With an interesting subject matter, Straight Outta Compton comes with plenty of potential. Unfortunately, it feels like a standard issue biopic that doesn’t bring anything especially interesting to the table. The Blu-ray offers good picture and audio as well as an average collection of supplements. Compton offers a dull drama that disappoints.